Surfing in India is growing in popularity, and there are some great spots along the country's vast coastline where you can catch a wave and also learn to surf. The only issue is that the waves aren't consistent and the surf does fall flat at times. You need to be at the right place at the right time! Waves generally rise between three and five feet most of the year. Bigger and faster world-class waves (of over eight feet), suited to advanced or professional surfers, can be experienced just before and during the monsoon, from May to September. You can expect a lot of rain with them though! The big swells decline from October to December, after which conditions return to normal gentle waves. For added fun, don't miss the India Surf Festival that takes place near Puri in Odisha every year. Covelong Point Social Surf School. Located around 40 kilometers south of Chennai, Covelong (or Kovalam, as it's also known) is an inspiring fishing -- turned surfing -- village with a remarkable social surfing movement, many of India's best surfers, and the most reliable waves. There are both beach and reef breaks, and right-hand break points that are more dependable than possibly anywhere else on the mainland. The annual Surf Classic & Music Festival takes place there every September. Free surfing lessons are offered as part of it. Where to Learn: Covelong Point Social Surf School opened a fantastic new surf facility in mid-2015, featuring a cafe, lounge, and guest rooms right on the beach. Part of the earnings ​goes toward funding social projects in the village. Read more about the heartening story of the surf school, operated by extraordinary local surf pioneer Murthy, and how it's transforming lives. Also check out Ocean Delight Surf School, founded in 2015 by one of the area's top surfers. A little further down the Tamil Nadu coast, around 60 kilometers from Chennai, Mahabalipuram (also known as Mamallapuram) has right-hand point breaks near the iconic Shore Temple. They're created by the pile of boulders, placed around the temple and jutting into the Bay of Bengal, to keep it from toppling into the ocean. There's a thriving backpacker scene in Mahabalipuram as well. Do note that the waves depend on the positioning of the sand and they usually fall flat in October and November. There's no point break until May when most of the sand gets washed away from the beach and forms a sandbank. June and July produce perfect waves, and they last quite well until the end of September. Where to Learn: Mumu Surf School, headed by the laid-back and friendly Mumu, gives excellent (yet fun) lessons, professional coaching, and has a surf shop. There's also a board shaping workshop, Temple Surfboards, in Mahabalipuram. Vizag (Vishakapatnam), the second largest city in Andhra Pradesh, stands out for its wide beaches and diversity of surfing spots. There are nearly 20 point breaks, including five with good surf, in the vicinity. Many are known only to locals. However, the most popular spots are Rushikonda Beach and Ramakrishna Beach. The waves are well suited to beginners. They're quite powerful but not too steep. Where to Learn: Lonely Surfers Surf School on Rushikonda Beach was founded in 2009 by local Andy (Anudeep), who used to sail yachts but became passionate about surfing. India's most well-known surf spot is likely to be Kovalam Beach in Kerala. Although it doesn't have the best surf, it's a hot tourist destination with plenty of hotels and places to hang out. And, the waves around Lighthouse Point are decent enough most of the time. They break both left and right. Where to Learn: Kovalam Surf Club, founded in 2005, is part of a larger NGO called the Sebastian Indian Social Project. It aims to empower local children and keep them at school by getting them involved in surfing. Surfing lessons are priced cheaper than other surf schools in India as Kovalam Surf Club isn't a commercially-driven organization. One-on-one individual classes are given and surf tours are also offered. The surfing season at eclectic Auroville and Pondicherry is long, with waves of up to 12 feet from June to January. Much of the action takes place at Serenity Beach, where surf breaks were created by two long piers that were built to protect the beach following the devastating 2004 tsunami. Where to Learn: Kallialay Surf School is situated at Serenity Beach. It was started by two young Spanish brothers, who discovered their passion for surfing after their parents relocated the family to Auroville in 1995. They shape their own boards and also built India's first skate park in Auroville. Various surfing packages are offered, from single lessons to comprehensive 15-day courses. Surfboard rentals are also possible. Mulki, a small village around 30 kilometers north of Mangalore, is home to India's first surf school. The beach is relatively unknown and uncrowded, with waves suited to beginners for most of the year. Where to Learn: Mantra Surf Club was started in 2004 by two American surfing experts (including "Surfing Swami" Jack Hebner), who also pioneered surfing on the East Coast of the United States. The Club has India's largest inventory of surfboards, so you're sure to get one that's perfect for your size and skill level. Stay at their Ashram Surf Retreat, operated by surfing Krishna devotees, and add yoga and meditation for a unique spiritual experience. Numerous other adventure water sports are offered as well. Surfing memberships are available. Artist in doing nothing/Getty Images. Pilgrims, backpackers, hippies, and wandering surfers all converge on the picturesque temple town of Gokarna in Karnataka. Its placid beach breaks make it a good place for beginners to learn to surf from October to May. The best waves can be found on Main Beach near Mahabaleshwar Temple. Where to Learn: Cocopelli Surf School on Long Beach (just north of Main Beach) has a basic guesthouse, with the beach only a minute's walk from the door. Various courses are offered, from beginner to advanced. Those who have always regarded Varkala as a close-out beach break not worth bothering about should think again. While this may be true for the main beach, it's still fine for beginners and it does pick up the swell. Besides, there are plenty of other better breaks in the vicinity -- some of which very few people know about. Where to Learn: Soul and Surf have been offering surfing lessons in Varkala since 2010. What makes them unique is that they also specialize in yoga, so you can combine the two! Surfing lessons take place seven days a week, at the best spots that they scout out early in the mornings. They're open from the beginning of October until mid May. Accommodations are also available. If you really want to get away from it all, and are an intermediate or advanced surfer, head to the pristine Andaman Islands. Most of the surfing spots can only be accessed by boat. 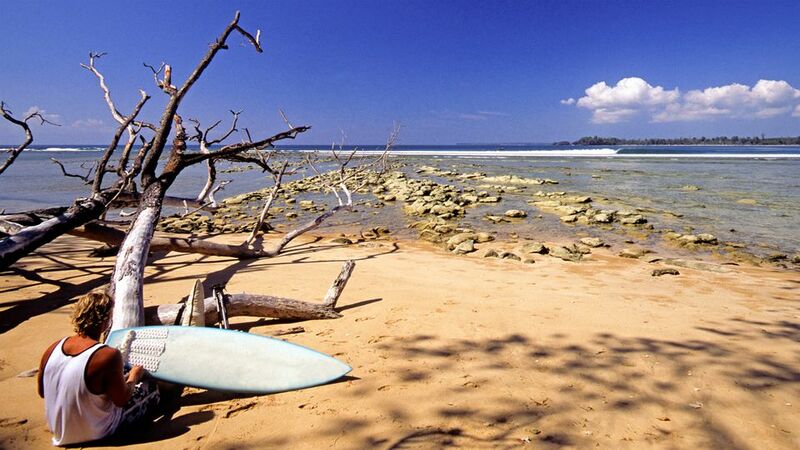 However, Little Andaman Island (the furthest inhabited island) has an emerging surf scene, with some of the best waves in India. There are reef breaks, so do bring reef shoes to avoid cuts. The biggest waves, created by distant storms, occur from March to early May. Where to Learn: Surfing Little Andaman has a camp at Hut Bay. They hire out boards, conduct lessons, and have heaps of information about the surf.